To look at one was to see the other. For family, even the girls’ own father, it was a constant guessing game. For strangers, the surprise was overwhelming. And for the twins Olivia and Victoria Henderson, two remarkable young women coming of age at the turn of the century, their bond was mysterious, marvelous, and often playful–a secret realm only they inhabited. Olivia and Victoria were the beloved daughters of a man who never fully recovered from his wife’s death bearing them in 1893. Shy, serious Olivia, born eleven minutes before her sister, had taken over the role of mother in their lush New York estate, managing not only a household but her rebellious twin’s flights of fancy. Free-spirited Victoria wanted to change the world. She embraced the women’s suffrage movement and dreamed of sailing to war-torn Europe. Then, in the girls’ twenty-first year, as the first world war escalated overseas, a fateful choice changed their lives forever. It began when Victoria’s life was about to become a public scandal. It led to a painful decision, and brought handsome lawyer Charles Dawson into the Henderson’s life and family. Hand-picked by the twins’ father to save his daughter’s reputation, Charles was still mourning his wife’s death aboard the Titanic, struggling to raise his nine year-old son alone, determined never to lose his heart again. Charles wanted to believe that, for the sake of his son, he could make an unwanted marriage work. But in an act of deception that only Olivia and Victoria could manage, the twins took an irrevocable step, which changed both their lives forever; and took one of the twins to the battlefields of France, the other into a marriage she longed for but could not have. From Manhattan society to the trenches of war-ravaged France, Mirror Image moves elegantly and dramatically through a rich and troubled era. With startling insight, Danielle Steel explores women’s choices: between home and adventure, between the love for family and the passion for a cause, between sacrifice and desire. 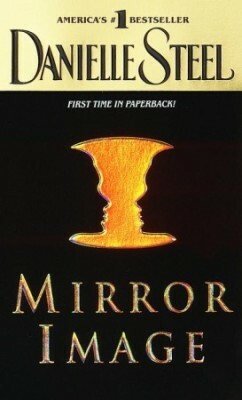 But at the heart of Mirror Image is a fascinating, realistic portrait of identical twins, two vastly different sisters who lead their lives and follow their destinies against a vivid backdrop of a world at war.